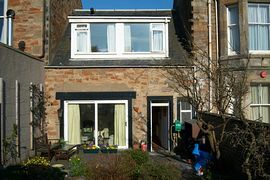 Rowan Cottage is a delightful, newly modernised cottage very close to the award winning beach in Elie. 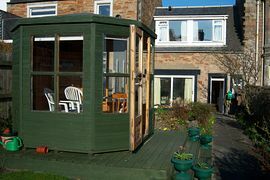 There are sea views and a summer house in the pretty back garden which overlooks the sea. All the amenities Elie has to offer are close by - the golf course, tennis courts, putting, bowling and the coastal walk are all within walking distance. 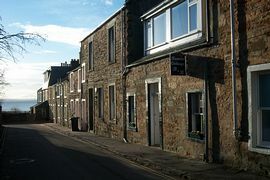 Elie has excellent pubs, shops and restaurants and is well placed for visiting the other villages in the East Neuk of Fife. St Andrews, the home of golf is 20 minutes away and the East Neuk is full of excellent golf courses and also places of historical interest. 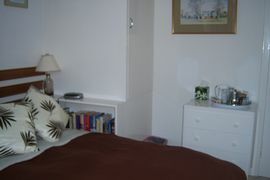 A full Scottish breakfast is offered with TV, hairdryers and tea making facilities in the bedrooms that are available as doubles or singles with the shower room in between. Only one party is taken at a time so upstairs is private to the guests. £40 single in Easter to September inclusive. 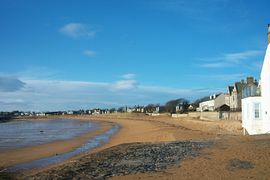 Come into Elie by Park Place, turn right and and first left towards the beach is Fountain Road with the sign outside.